Slovenia has only one national park, Triglav. But that’s a real treasure! A mountain paradise with snowcapped peaks and magically green lakes, creeks and waterfalls. 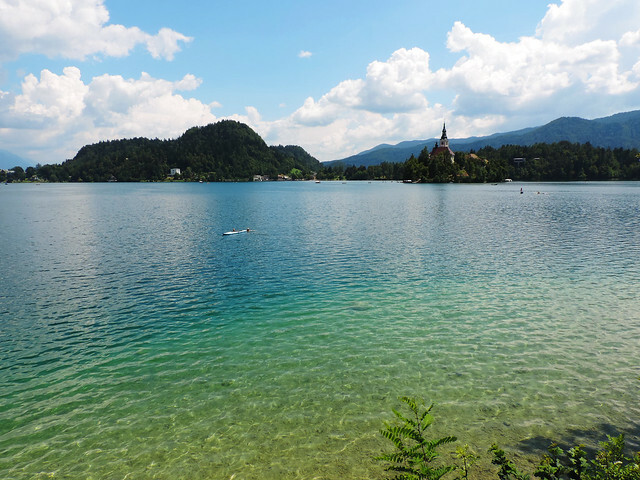 Its most easily accessible areas are around Lake Bled and Lake Bohinj, two big, famous and pretty lakes. Usually it’s hard for us to decide which places we love the most of all the beautiful ones we visit. They are all unique and each of them is the most beautiful in their own way. 😛 But when we have an opinion, that’s a strong one. This is the rare case if you ask which one did we enjoy more: visiting Bled or Bohinj. 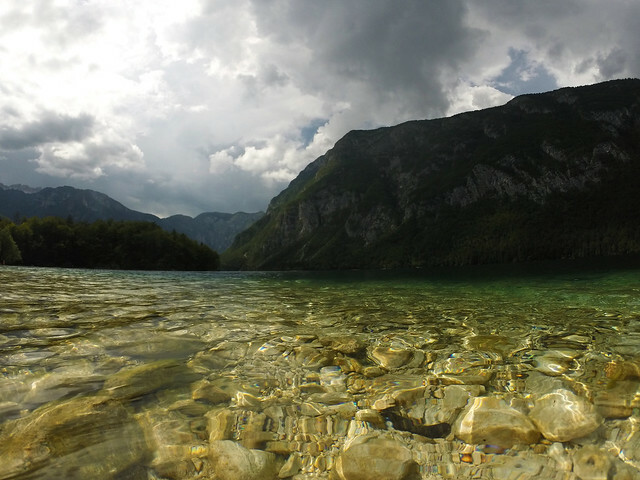 Our answer is quick and confident: Lake Bohinj! Of course, this doesn’t mean that you will feel the same way or you have to agree. It’s just our opinion based on our experience. Both of these lakes are amazing and they are quite close to each other, so you can visit both and decide for yourself. 🙂 For now, we want to share how was our visit this July and what’s worth seeing and doing near Bled and Bohinj. Crystal clear, incredibly green Lake Bohinj surrounded by the wild, high peaks of the Julian Alps was love at first sight. Even 5 minutes barely passed after we parked at the lakeshore and we were there in the water, swimming. Not that its temperature is ideal for swimming (maximum temperature of the water is around 20℃ in July and August), but it’s not too bad either and it’s such a wonderful place to swim! 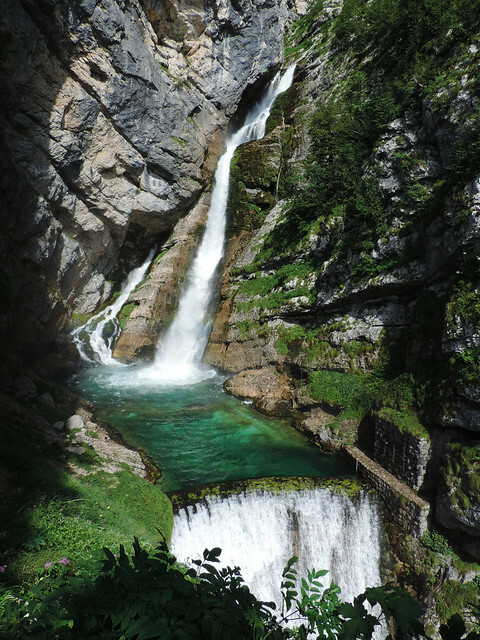 We also drove along its southern shore by car and headed towards Ukanc for a short hike to Savica Waterfall (Slap Savica in Slovene). It’s a really easy and nice hike with a 78 metres high waterfall in the end. Pretty reward! 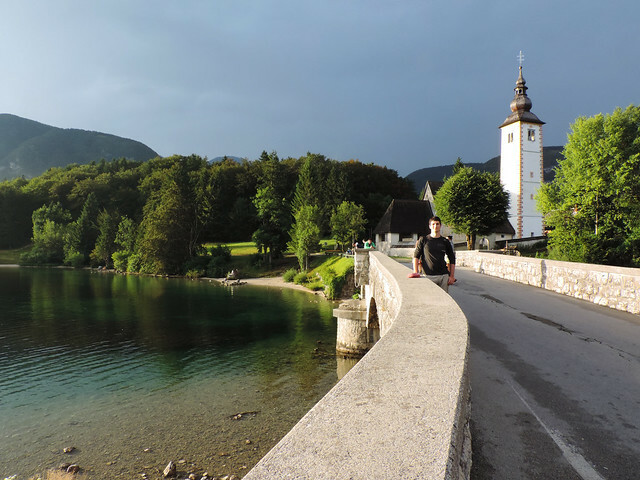 Originally we planned to do the loop trail around Lake Bohinj, but we changed our plans. On its southern shore, the road used by cars is closer to the lake than the walking trail and that didn’t seem ideal at all. We want to be close to nature not to cars while hiking. With that said, there’s a lot of beaches on the southern shore and they are easily accessible by car. But we saved the hike for the northern shore where there’s only a walking trail, no road and no traffic. 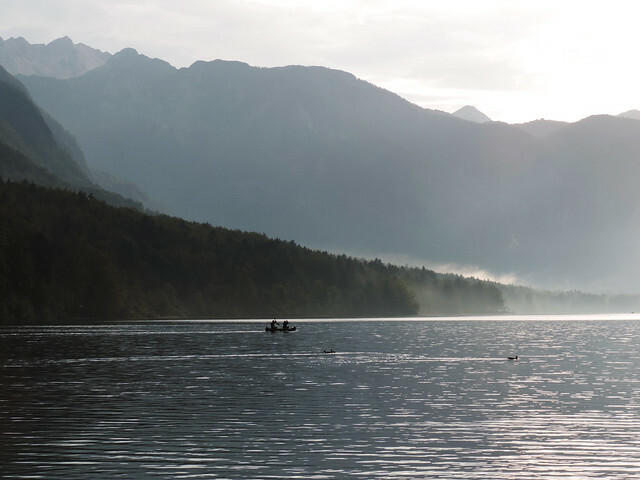 We got excited about renting a canoe instead and that’s indeed an enjoyable and beautiful way to explore Lake Bohinj. Our favorite way, actually! And renting a canoe for 4 hours was not even expensive (around 20 EUR) compared to the parking fees. We paddled along the shore and paddled across the lake and stopped at plenty of lovely hidden beaches. But the last hour of our canoe expedition was washed away by a thunderstorm. So as our late afternoon hike on the northern shore. That’s life and it was not even an unexpected thing. Thunderstorms are actually quite likely in the Julian Alps in July and August. What we didn’t expect was that the temperature also drops significantly. 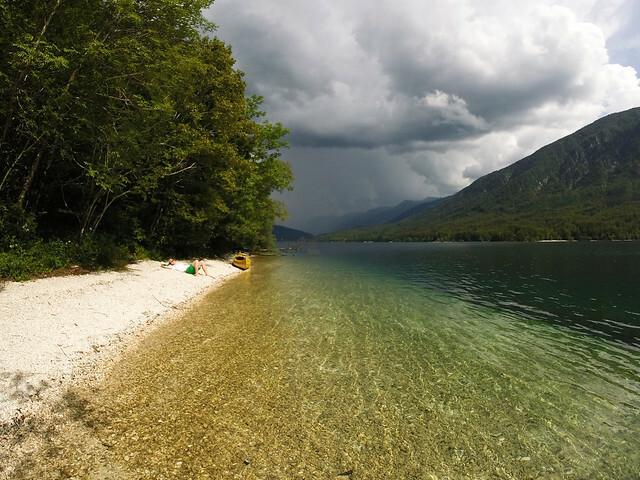 But we enjoyed our day at Lake Bohinj despite of the crazy thunderstorm and that’s really something. 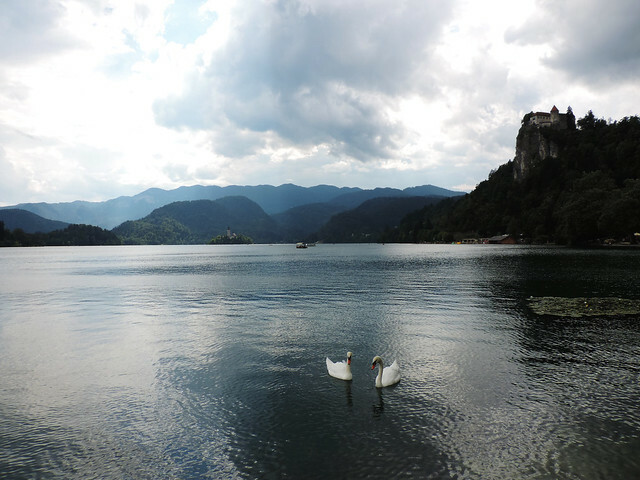 We arrived to Lake Bled the following day with quite high expectations. You already suspect something? You’re right. It’s never a good idea. Lake Bled is probably the icon of Slovenia, the symbol of all the natural beauties of this small country. So yeah, good idea or not we couldn’t help having our expectations. But we didn’t start our day at the lake, we went to the nearby Vintgar Gorge first. We were lucky to arrive early enough to find parking and the queue at the entrance was also fine in the morning (5 minutes waiting maybe). But it gets quite busy during the day! People were standing in a long line to get in by the time we finished our hike. We got back to Lake Bled around noon. We walked around the lake, it was sunny and hot so we stopped for swimming occasionally. Only for short swims as its water is exactly as cold as Lake Bohinj. Views of Bled Castle and the high peaks in the distance were very pretty. What we missed is the peaceful atmosphere and that feeling of being close to nature. Lake Bled is such a developed area full of hotels and cafes and restaurants – not to mention cars and people – that we didn’t feel connected to nature at all. We also felt it overpriced. It’s a beautiful lake and of course, it’s touristy, and of course, tourism is a business, too… But whether it’s parking or kayak rental the prices at Bled are ridiculous compared to other wonderful mountain lakes in Slovenia. Sure, it’s beautiful, but not that beautiful that it’s worth those prices. At least that’s what we felt. Then a sudden thunderstorm interrupted our adventure around the lake. We were not even surprised this time. But this meant we skipped the hike planned for the afternoon: a hike up to the top of Osojnica Hill to get a view of Bled from above. Would we love Bled more if we would have hiked a bit further from the crowd? We’ll figure out next time. Both Lake Bled and Lake Bohinj are perfectly clear pretty lakes, but Bohinj is less crowded, less touristy and less expensive. 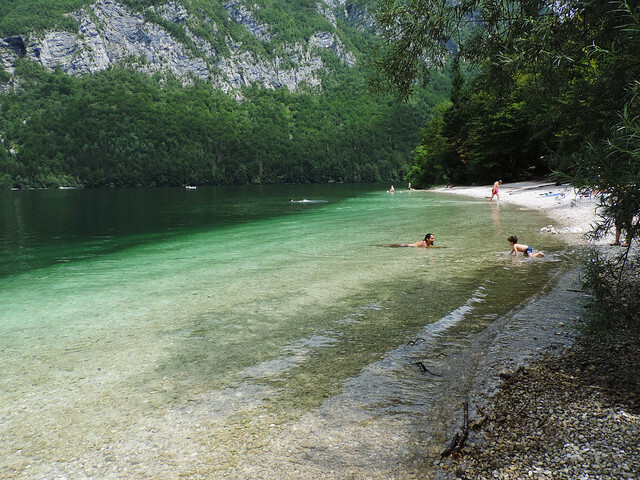 We discovered several hidden beaches at Bohinj while beaches at Bled are more developed (and more crowded). There’s cool shorter and longer hikes in both areas, but the high mountains are closer to you at Bohinj. However, Bled has a castle towering above the lake and it has a cute small island, too. 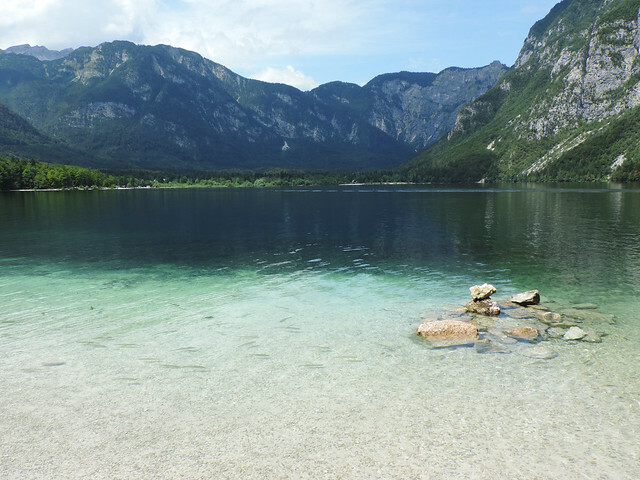 So the winner is… It’s no secret that our winner is Lake Bohinj, but which is yours is up to you. If you need winners. Or you can simply enjoy your time at both. Prepare for parking fees at both lakes which are charged per hour. You have to pay in advance and you better have coins in order to pay the exact amount as the machines won’t give back money. While hiking to Savica Waterfall we parked at Koča pri Savici hut which is also a paid parking lot and there’s an entrance fee to the waterfall in addition. Yes, you better have a bunch of coins and smaller bank notes. Unfortunately, parking fee is charged almost everywhere around both Lake Bled and Lake Bohinj. 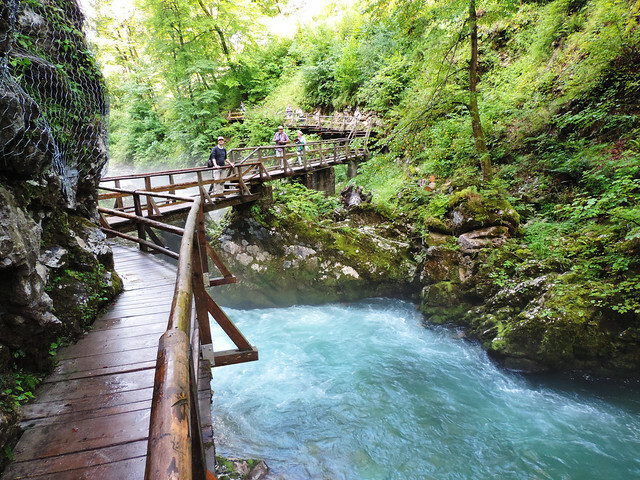 There’s entrance fee at Vintgar Gorge as well. Arrive early to avoid the crowd especially in summer. Parking is free, but limited. You can even walk from Bled to Vintgar, but it’s a long walk then. Have you ever been to Slovenia? Which is your favorite place there? Your welcome, Enette. Have a wonderful trip! The Vintgar gorge is fairylike but overflowed. Our favorit place in Slovenia is… tatatataaaaa… the soca valley ❤ So wonderful and you can do cool adventures (canyoning, rafting, paragliding and the ziplines are great). And also Ljubljana is an amazing city. We love Slovania… and someday we will be back. No problem with your English at all. We are not natives either. 😉 Thanks for your kind comment!